Single crystals of glycine (GL) and creatinine doped glycine (GLC) crystals were crystallized using slow evaporation solution growth technique. Structural analysis of the grown crystals has been carried out using single crystal XRD. The polymorphic forms and lattice parameters of glycine crystals were confirmed. The identification of functional groups and the intensity variation, peak shifting caused by creatinine in glycine crystals were recognized by Raman spectroscopic analysis. Good optical quality and the optical parameters such as optical band gap, cut-off wavelength, transmittance were inferred from UV–Visible spectroscopy. Second Harmonic Generation (SHG) shows significant enhancement in the efficiency of GLC crystal. GLC exhibited improved piezoelectric coefficient d33 of 8 pC/N which was higher compared with other glycine crystals. The incorporation of creatinine increases the mechanical strength and laser stability (41.93 GW/cm2) of GLC crystals. In doped glycine crystal, dielectric constant increases with decrease in dielectric loss. 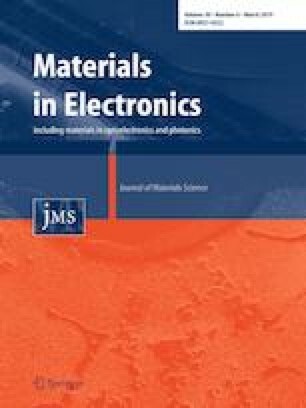 All enhanced physical properties of GLC crystal were investigated which proposes the suitability of GLC crystal towards Optoelectronic applications.